Anti-Golgi complex antibodies (AGAs) are primarily associated with systemic lupus erythematosus and Sjögren's syndrome. Here we report on the immunoreactivity of AGAs against five Golgi autoantigens (giantin, golgin-245, golgin-160, golgin-95/GM130, and golgin-97) and provide data from epitope mapping on the most common Golgi autoantigen, namely giantin. A total of 80 human sera containing AGAs, as defined by indirect immunofluorescence on HEp-2 cells, were analyzed by ELISA using recombinant autoantigens and immunoprecipitation. The proportion of AGA sera that reacted with the five Golgi autoantigens was correlated with the molecular mass of the Golgi antigens. Autoantibodies to giantin, the largest Golgi autoantigen, were the predominant AGAs, being found in 50% of the AGA sera. Epitope mapping of giantin was performed using six recombinant fragments spanning the entire protein. Antigiantin-positive sera with low titer autoantibodies recognized epitopes in the carboxyl-terminal fragments that are proximal to the Golgi membrane, whereas higher titer sera exhibited strong reactivity to amino-terminal and central domains that are likely to extend from the Golgi membrane into the cytoplasm. Our working hypothesis is that aberrantly expressed Golgi complex autoantigens may be released into the immune system when cells undergo lysis. By virtue of a carboxyl-terminal transmembrane domain, giantin is likely to be more stably associated with the cytoplasmic face of the Golgi complex than are other golgins, which are peripheral proteins. The stable association of giantin with the putative released Golgi complex may contribute to its preferential autoantigenicity. The Golgi complex is an elaborate cytoplasmic organelle that has a prominent function in the processing, transporting, and sorting of intracellular proteins subsequent to their synthesis in the rough endoplasmic reticulum. Structurally, the Golgi complex is localized in the perinuclear region of most mammalian cells and is characterized by stacks of membrane-bound cisternae, as well as by functionally distinct trans-Golgi and cis-Golgi networks . Interestingly, several Golgi proteins have been reported to be targets of the autoimmune response, even though they are localized to the cytoplasmic face of Golgi membranes, a site that is presumed to be privileged in that it is protected from immune surveillance. Autoantibodies directed against the Golgi complex were first identified in the serum of a Sjögren's syndrome patient with lymphoma . Several isolated reports have described anti-Golgi complex antibodies (AGAs) in other systemic autoimmune diseases such as systemic lupus erythematosus (SLE) , rheumatoid arthritis , mixed connective tissue disease , and Wegener's granulomatosis . AGAs were also found in 10% of patients with HIV infection  and 35.7% of HIV carriers ; however, in the more recent report by Massabki and coworkers , AGAs were not found in 100 HIV-infected patients. Within the past several years, our laboratories and others have cloned and identified several novel Golgi autoantigens. This has been achieved primarily by expression cloning using human autoantibody probes. These Golgi autoantigens are referred to as giantin/macrogolgin/GCP372, golgin-245/p230, golgin-160/GCP170, golgin-95/GM130, golgin-97, and golgin-67, with their names based in part on their molecular weights as estimated from SDS-PAGE under denaturing conditions [7, 10–13]. A common feature of this family of Golgi autoantigens is that they all have coiled-coil domains throughout the entire protein except for short nonhelical regions at the amino-terminus and carboxyl-terminus . Golgin-245 was localized to the trans-Golgi compartment , whereas GM130 has been reported to be localized to the the cis-Golgi compartment . It has been also reported that several golgins, such as golgin-245 and golgin-97, are attached to Golgi membranes through a GRIP domain in the carboxyl-termini . In contrast to other Golgi autoantigens, giantin has a single transmembrane domain in the carboxyl-terminus . A second common feature among the Golgi autoantigens is that biochemical evidence and immunoelectron microscopy data show that they are peripheral or transmembrane (giantin) proteins on the cytoplasmic face of the Golgi complex. The implication is that these Golgi autoantigens may have common biochemical characteristics and functions that make them preferred autoimmune targets among the approximately 100 Golgi complex proteins described to date . A third common feature among the Golgi autoantigens is that none of these macromolecules are localized to apoptotic blebs ; in fact, immunofluorescence analysis showed that the Golgi complex was altered and developed distinctive characteristics during apoptosis and necrosis . It is striking that human autoimmune responses are selective for these proteins that are rich in coiled-coil motifs and that reside on the cytoplasmic face of the Golgi complex. How this family of coiled-coil proteins becomes autoimmune targets remains to be determined. One possible explanation is that these Golgi proteins may be recognized as surface structures on the organelle that is exposed to the immune system in aberrant disease states associated with unregulated cell death (apoptosis and necrosis) resulting from injury or infection, and defective clearance of dying cells. Although it is known that AGAs are associated with some autoimmune diseases or viral infections, the prevalence of AGAs and their fine specificity have not been reported. Immunoblotting and immunoprecipitation studies have shown that AGAs reacted with a number of cellular proteins . AGAs are generally considered to be rare autoantibodies; however, Bizzaro and coworkers  suggested that the presence of AGAs in high titer in the absence of a clear clinical manifestation may constitute an early sign of systemic autoimmune diseases. Here, we present data on the reactivity of AGAs against known Golgi autoantigens by ELISA using five recombinant proteins. Because antigiantin autoantibodies were found to be the most common reactivity in AGAs, epitope mapping was performed using six overlapping recombinant fragments of giantin. Human putative AGA sera and normal control sera were obtained from the laboratory serum bank and Advanced Diagnostics Laboratory at the University of Calgary, Canada. Some AGA sera were also provided by Drs R L Humbel (Luxembourg), Kiyomitsu Miyachi (Keigu Clinic, Yokohama, Japan), and Carlos A von Mühlen (Pontifícia Universidade Católica do Rio Grande do Sul, Porto Alegre, Brazil). All sera were provided as anonymous samples and were stored at -80°C until use. The reactivity to Golgi complex in all AGA sera was confirmed by indirect immunofluorescence (IIF) microscopy on HEp-2 cells (Immuno Concepts Inc., Sacramento, CA, USA). Double staining was performed using the human sera (1 : 100 dilution) and rabbit antigiantin antiserum (1 : 500 dilution) as a marker of the Golgi complex . The secondary antibodies were Alexa Fluor® 488 conjugated goat antihuman IgG reagents and Alexa Fluor® 568 conjugated goat antirabbit IgG reagents (Molecular Probes, Eugene, OR, USA) used at a dilution of 1 : 400. Nuclei were counterstained with 4',6-diamidino-2-phenylindole. By using this approach, a total of 80 sera exhibited specific staining of the Golgi complex. Recombinant human Golgi autoantigens were produced using the expression plasmid pET28 system in Escherichia coli BL21 (DE3; Novagen, Madison, WI, USA) as previously described . Recombinant proteins of golgin-245 (amino acids 811–2083) , golgin-160 (amino acids 787–1348) , golgin-95/GM130 (amino acids 370–990) , and golgin-97 (amino acids 1–767)  were subcloned into pET28 vectors for the expression of recombinant bacterial proteins. Six overlapping fragments P1–P6 representing the full-length giantin cDNA (GenBank accession number NM_004487)  were generated for epitope mapping analysis. Two fragments (P1 and P2) were obtained by expression cloning from a random-primed lambda phage cDNA library generated from human T24 cells using an antigiantin-specific human serum. Three fragments were obtained from an available expression sequence tag clone (P3, GenBank accession number N_76853; P4, GenBank accession number BG_567238; P5, GenBank accession number AI_458639). One fragment (P6) was cloned from reverse transcription polymerase chain reaction synthesis using total RNA purified from HeLa cells. All six fragments of overlapping recombinant proteins cDNAs were inserted into pET28 expression vector and introduced into Escherichia coli BL21 (DE3). Sequencing was conducted in both directions using custom primers. Bacterial pellets were suspended in 6 M guanidinium hydrochloride containing buffer, and the recombinant proteins were purified by nickel column chromatography according to manufacturer's instructions (Qiagen, Valencia, CA, USA). The concentration of the purified recombinant proteins was measured by a Protein DC Assay Kit (Bio-Rad, Hercules, CA, USA) and these samples were stored at -80°C until they were required for subsequent experiments. The ELISA protocol described by Rubin  was used with some modifications. In brief, Ni column affinity purified recombinant proteins were diluted in phosphate-buffered saline to a final concentration of 1 μg/ml and then coated on Immulon 2 microtiter plates (Dynatech Laboratories, Alexandria, VA, USA). Human sera were diluted 1 : 1000 and then incubated in the antigen-coated wells. Horseradish peroxidase-conjugated goat antihuman IgG (CALTAG Laboratories, San Francisco, CA, USA) was used at 1 : 5000 dilution and the substrate 2,2'-azinobis (3-ethylbenzthiazoline) sulfonic acid was added as the detection reagent. Each sample was analyzed in duplicate and the average optical density (OD) at 405 nm with a substrate development time of 15–45 min was used for data analysis. The cutoff value designating a positive reaction was the mean OD of 12 normal sera +3 standard deviations (SDs). HeLa cells (ATCC, Rockville, MD, USA) were metabolically labeled overnight with [35S]-methionine (Trans 35S-label; ICN), as described previously [11, 12]. Cell extracts were harvested in a lysis buffer containing 1% NP-40, 50 mmol/l Tris.HCl, pH 7.5 and 150 mmol/l NaCl, and supplemented with Complete™ protease inhibitor cocktail (Boehringer Mannheim, Indianapolis, IN, USA). Soluble fractions were used as substrate for immunoprecipitation reactions by combining 100 μl 10% protein A-Sepharose beads (Sigma, St. Louis, MO, USA), 10 μl human serum, 500 μl NET2 buffer (50 mmol/l Tris-HCl, 150 mmol/l NaCl, 5 mmol/l EDTA, 0.5% Nonidet P-40, 0.5% deoxycholic acid, 0.1% SDS, 0.02% sodium azide, pH 7.4), and 50–100 μl labeled cell extract. After 1 hour of incubation at 8°C, the Sepharose beads were washed five times in NET2. 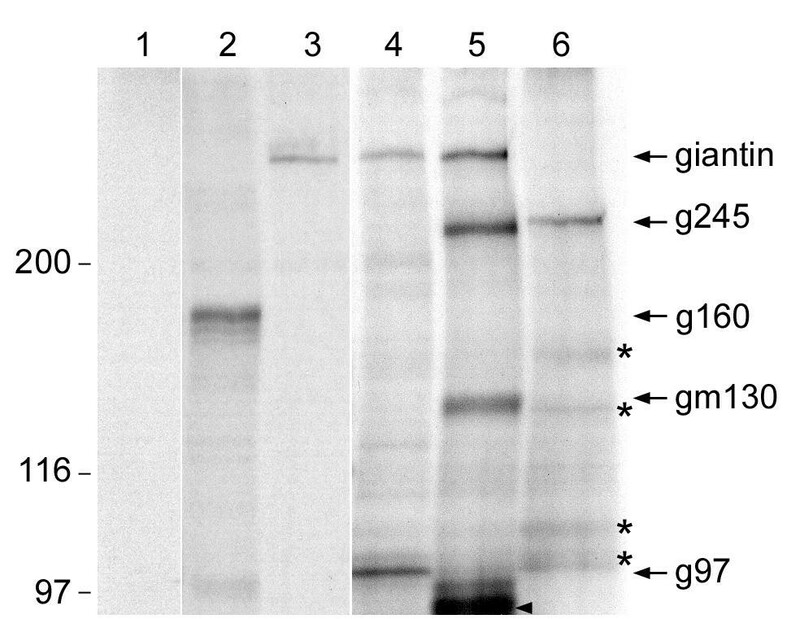 Proteins were eluted in 20 μl sample buffer and analyzed by 10% gel SDS-PAGE , followed by autoradiography. Affinity purified recombinant proteins were loaded on 12.5% SDS-PAGE gels (4 μg/lane), separated by electrophoresis, and transferred to nitrocellulose membranes using a Semi-Dry Trans-Blot apparatus (Bio-Rad), as described previously . Human sera containing antigiantin antibodies were used at dilutions of 1 : 100 to 1 : 500. Detection of bound antibodies was achieved using horseradish peroxidase-conjugated goat antihuman IgG antibody (CALTAG Laboratories), used at 1 : 5000 dilution, in combination with enhanced chemiluminescence (Super Signal; PIERCE Products, Rockford, IL, USA). Reactivity to Golgi complex antigens in all sera was confirmed by IIF, and all sera exhibited a specific staining pattern against Golgi complex structures as determined by colocalization with rabbit antibodies to giantin (Fig. 1). This approach yielded 80 human AGA sera that were used to investigate the prevalence of autoantibodies to five individual Golgi autoantigens represented by purified recombinant proteins in an ELISA and by immunoprecipitation using extracts from [35S]-methionine labeled HeLa cells (Fig. 2). The number of positive sera and frequency of reactivity of the 80 human AGA sera are summarized in Table 1. The most common Golgi complex autoantigen target was giantin (40/80 [50%]) and the second most common target was golgin-245 (19/80 [24%]). The lowest frequency reactivity (3.8%) was to golgin-97, and 25 AGA sera (31.3%) did not react with any of the five Golgi autoantigens used in the present study. Interestingly, the frequency of AGA sera reactive with the five Golgi autoantigens was numerically correlated with the molecular masses of the native Golgi autoantigens (Table 1), and the number of positive sera that reacted with giantin was remarkably higher than those for other golgins. The confirmation by immunoprecipitation was important because some of the Golgi autoantigens used as substrate in the ELISA did not represent full-length proteins and we were concerned that reactivity to these five Golgi autoantigens may be underestimated by ELISA alone. Among the 25 AGA sera that were negative for the five Golgi autoantigens, there were no predominant reactivities other than the five Golgi autoantigens described, even though the immunoprecipitation assay showed unidentified bands that were recognized by many of these sera. Immunofluorescence colocalization of putative human anti-Golgi complex antibody (AGA) sera with rabbit antigiantin antibody to confirm specificity to the Golgi complex. 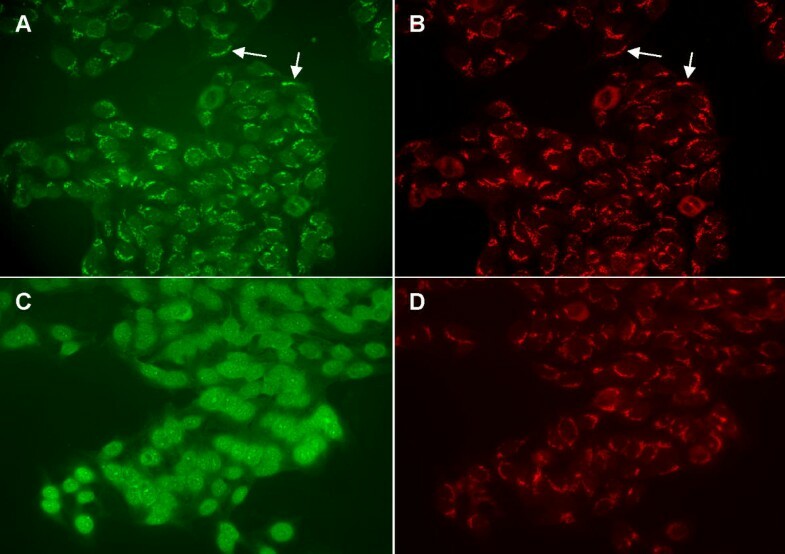 (a) A representative human serum exhibiting staining specific to the Golgi complex in HEp-2 cells colocalizes with (b) characteristic staining by rabbit antigiantin antibody (arrows). (c) A serum with diffuse nuclear and cytoplasmic staining unrelated to the Golgi complex as demonstrated by (d) lack of costaining with rabbit antigiantin antibody. Representative data from the immunoprecipitation analysis of anti-Golgi complex antibody (AGA) using extracts from HeLa cells metabolically labeled with [35S]-methionine for 16 hours. Lane 1, normal human serum; lanes 2–5, AGA sera. Lanes 2 and 3 show sera with primarily antibody to golgin-160 (g160) and giantin, respectively. Lane 4 shows a serum with antibodies to giantin and golgin-97 (g97). Lane 5 shows a serum with antibodies to giantin, golgin-245 (g245), gm130, and an unknown protein (arrowhead) migrated at approximately 90 kDa. Lane 6 shows a serum with strong reactivity to golgin-245 and weaker reactivity to several unidentified lower molecular weight proteins (*). A total of 80 sera were studied. We then determined whether there were specific correlations between any of the five specific AGAs with another AGA. None of the sera had AGAs to four or more of these five Golgi autoantigens. There were 6, 15, and 34 sera with antibodies to three, two, and one of the five Golgi autoantigens, respectively. Among the six sera with antibodies to three of the five antigens, four sera had antigiantin, antigolgin-245 and antigolgin-160, which were the three most common antibodies detected; one serum had antigiantin, antigolgin-245 and antigolgin-95/GM130 (Fig. 2, lane 5); and the remaining serum had antigiantin, antigolgin-245, and antigolgin-97. Among the 15 sera with antibodies to two of the five antigens, five had antigiantin and antigolgin-245, two had antigiantin and antigolgin-160, two had antigiantin and anti-GM130, two had antigiantin and antigolgin-97, two had antigolgin-245 and antigolgin-160, and two had antigolgin-245 and anti-GM130 (Table 2). No specific correlations were observed between the two most abundant antibodies, namely antigiantin and antigolgin-245. For example, among the 19 AGA sera positive for antibody to golgin-245, 11 (57.9%) were positive and 8 (42.1%) were negative for antigiantin antibody. Among the 40 AGA sera positive for antibody to giantin, 11 (27.5%) were positive and 29 (72.5%) were negative for antigolgin-245. Although the number of sera that bound golgin-160, GM130, and golgin-97 were relatively small, it was interesting that sera with these three autoantibodies did not overlap. In other words, sera positive for antigolgin-160 were negative for antibody to GM130 and golgin-97, and sera positive for anti-GM130 were negative for antigolgin-97 (Table 2). To examine the relative distribution of epitopes in giantin, we performed mapping using six overlapping partial length constructs of recombinant giantin. Expression vectors for the recombinant proteins P1–P6 were constructed to cover the full-length of giantin (amino acids 1–3259), with the exception of the 38 amino acids at the amino-terminus (Fig. 3). Forty sera containing antigiantin antibody were analyzed using ELISA (Fig. 4, Table 3). Based on reactivity to the P1–P6 peptides, we provisionally divided the positive sera into low-positive and high-positive groups. Low-positive was defined as OD values between the mean OD of normal sera plus 3–15 SDs, whereas high-positive was defined as the OD greater than the mean OD of normal sera plus 15 SDs. Giantin is known to be bound on the cytoplasmic face of the Golgi complex via its single carboxyl-terminal transmembrane domain, and the amino-terminal and the central domains extend into the cytoplasm [24, 25]. Physical map of giantin cDNA fragments used in epitope analysis. The open box denotes the open reading frame. P1–P6 represent overlapping segments expressed as recombinant proteins, together spanning almost the full length of giantin. The P1 fragment differs from the published sequence and represents an alternatively mRNA spliced product. (b) Coiled-coil domains of giantin, golgin-245, golgin-160, golgin-95/GM130, and golgin-97. Each macromolecule is depicted showing the coiled-coil regions, as predicted by the COILS program . A transmembrane (TM) hydrophobic region of 20–22 amino acids at the carboxyl-terminus is postulated to be responsible for anchoring giantin to Golgi membrane, with the molecule extending to the cytoplasm. The cytoplasmic domains of giantin are responsible for interaction with other Golgi proteins GM130 and p115. A total of 40 antigiantin positive human sera were analyzed for reactivity in ELISA. Cutoff value for a positive reaction: the mean optical density (OD) of normal human sera +3 standard deviations (SDs). Low-positive: the OD between the mean of normal sera +3 SDs to +15 SDs. High-positive: OD greater than the mean of normal sera +15 SDs. aa, amino acids. Reactivity of human antigiantin positive sera against six overlapping giantin fragments. A total of 40 antigiantin positive sera were analyzed by ELISA. Black squares represent optical density (OD) values for each individual serum. Dotted lines represent cutoff values for the low-positive group (between the mean OD of normal sera plus 3–15 standard deviations [SDs]), and dashed lines represent cutoff values for the high-positive group (greater than mean OD of normal sera +15 SDs). None of antigiantin positive sera showed high positive reactivity to P5 or P6 peptides; however, the highest proportion of antibody reactivity (22/40 [55%]) was to P6, which includes the carboxyl-terminus and the transmembrane signal sequence. P5, which is proximal to the transmembrane domain and the cytoplasmic face of the Golgi membrane, also exhibited higher antibody frequency than those for other fragments more distal to the transmembrane domain (P1–P4). 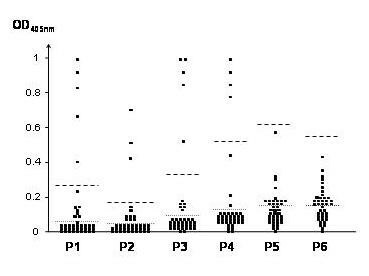 In contrast to anti-P5 and anti-P6, some AGA sera had antibodies to the distal fragments P1–P4 exhibiting high-positive reactivity, but the overall frequency of antibody to these fragments was relatively low (Fig. 4 and Table 3). All of the antigiantin sera reacted with one or more of the giantin subfragments used for epitope mapping. There were no specific correlations between P1–P4 high-positive sera (Fig. 4) and another coexisting AGA; among the P1–P4 high-positive sera, only one serum had coexisting antigolgin-160 and a second serum had coexisting anti-GM130. Taken together, these data suggest that the major epitopes of giantin are located in the carboxyl-terminal domain, including the transmembrane signal sequence. However, the epitopes localized in the distal amino-terminus or central domains of giantin can generate stronger autoimmune responses than can the epitopes in the transmembrane region. In the present study we investigated the frequency of autoantibodies to specific Golgi complex autoantigens in a cohort of human sera containing AGAs as defined by IIF. The most frequent target autoantigen was giantin. Autoepitopes of giantin span across the entire protein, but the most frequent reactivity was located in the carboxyl-terminal fragments P5 and P6. These data are consistent with the earlier report by Seelig and coworkers  describing a diverse spectrum of AGAs that recognized different recombinant fragments in a smaller cohort of AGA sera. In contrast to antibodies to giantin, the least common AGAs were those directed at golgin-97, which also has the lowest molecular mass among the group of Golgi complex autoantigens included in the present study. The proportion of antibody to giantin was more than 10-fold greater than that to golgin-97. To understand the mechanism of Golgi autoantibody production, it is important to consider why giantin has a greater frequency of reactivity than do other golgins. 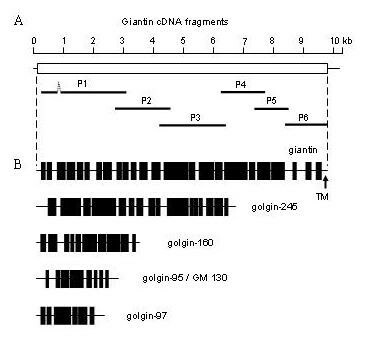 Differences between giantin and other golgins include the following: giantin is the highest molecular weight Golgi protein and contains a greater number of coiled-coil domain units than other golgins (Fig. 3b); and only giantin possesses a transmembrane domain, which may ensure its tight association with the Golgi complex. Although we showed that the majority of sera that react with the Golgi complex in an IIF assay react with known Golgi autoantigens, 25 out of 80 (31.3%) AGA sera did not recognize any of the five Golgi autoantigens examined in this study. The data suggest that these sera react with other Golgi autoantigens. A candidate Golgi autoantigen is GMAP-210, a reported cis-Golgi network associated protein that also contains characteristic coiled-coil domains . Among the 80 AGA sera, our immunoprecipitation data revealed three sera with a common band at approximately 210 kDa that might represent GMAP-210; however, because we did not have the cDNA for GMAP-210 and the frequency of this putative anti-GMAP-210 antibody was low, we did not confirm these data using independent methods. Two other Golgi proteins that may be candidate autoantigens include golgin-84, an 84 kDa transmembrane Golgi protein ; and βI Sigma spectrin, a 220 kDa protein that is associated with Golgi complex and vesicles . However, our immunoprecipitation data did not yield any bands consistent with these Golgi complex candidate autoantigens. We did not include other known Golgi autoantigens such as golgin-67  and p115  because the frequencies of these autoantibodies are known to be low. Thus, our data support the notions that the five selected Golgi autoantigens are the most prevalent in AGA sera and that giantin is the most common Golgi autoantigen recognized in AGA sera. Coiled-coil domain units may enhance selection as autoantibody targets? The Golgi autoantigens identified to date are related because they have similar overall secondary structures, as evidenced by extensive coiled-coil rod domains in the central region and small non-coiled-coil or globular domains at both the carboxyl-terminus and amino-terminus . The cumulative length of coiled-coil domains are thus directly proportional to the molecular mass of the Golgi autoantigens (Fig. 3b). For example, giantin clearly has more coiled-coil units than does golgin-97. The human autoimmune response to Golgi autoantigens appears to be highly specific because many AGA sera react with only one (34/80 [42.5%]) or two (15/80 [18.8%]) of the five autoantigens. The specificity of the autoimmune response is demonstrated in the present study. For example, 23 of the 40 antigiantin positive sera reacted with giantin without coexisting autoantibodies to other five golgins. The lack of correlation with the frequency of antibody, as shown in Table 2, is consistent with the conclusion that it is unlikely that the immune response is merely directed at cross-reactive coiled-coils in these self-proteins. It is interesting to note that large (approximately 100 kDa or greater) coiled-coil rich proteins were noted in many non-Golgi cytoplasmic organelles, including endosomal protein EEA1  and CLIP-170 , and the centrosomal proteins pericentrin , ninein , and Cep250 and Cep110 . The mitotic organelles are also known to be associated with large coiled-coil rich autoantigens, including the mitotic apparatus proteins NuMA [35, 36] and centromere-associated protein CENP-E  and CENP-F . It is noteworthy that we did not observe coexisting autoantibodies to these other coiled-coil rich organelles in our study of these AGA sera. These endosome, centrosome, and mitotic apparatus associated autoantigens are, like the golgins, proteins with high molecular masses and high content of coiled-coil domains. The combination of these two physical features in autoantigen may promote the induction and production of autoimmune antibody in certain disease states. As discussed above, this may have general significance in other autoantigens other than those associated with the Golgi complex. Another possible reason why giantin has a high frequency of reactivity among the Golgi autoantigens is that giantin is a somewhat unique Golgi complex autoantigen in that it possesses a transmembrane domain. It is not clear why and how the immune system is able to recognize or target these proteins because it is generally thought that the immune system is not exposed to intact intracellular self-antigens. One possible explanation is that they may be surface structures represented on cytoplasmic organelles that are recognized as foreign by the immune system in aberrant disease states associated with unregulated cell death (apoptosis or necrosis) resulting from injury or infection. A variety of autoantigens are cleaved into signature fragments during apoptosis and necrosis . The emerging view is that the modified forms of autoantigens generated during cell death might stimulate autoantibody responses if presented to the immune system in a proinflammatory context . We and others previously reported that distinct cleavage fragments of Golgi autoantigens were generated during apoptosis and necrosis, and we also observed that, compared with other golgins, giantin is readily cleaved into multiple fragments during apoptosis [19, 41]. Furthermore, we observed that the Golgi complex itself was also fragmented during apoptosis and necrosis . It is interesting to note that, unlike 60 kDa SS-A/Ro and some other autoantigens targeted by autoantibodies from Sjogren's syndrome and SLE sera , golgins do not appear to be expressed on membranous apoptotic blebs . One explanation for this apparent paradox may be the unique nature of the trans-membrane domain of giantin and the GRIP domain of other golgins that allow the presentation of these Golgi membrane-stabilized antigens to the immune system independently of apoptotic blebs. It is possible that giantin is more stably associated with the remaining Golgi surface membrane than other golgins by virtue of its transmembrane domain when cells undergo cell death. Because the cleaved Golgi autoantigens are antigenic [19, 41], they may play a role in sustaining autoantibody production in certain autoimmune disease states. Our work and that of other investigators have shown that coiled-coil rich Golgi proteins are the predominant targets of human anti-Golgi autoantibodies. Here we showed that the most common Golgi autoantigen was giantin. Our data suggest at least two possible explanations for the production of human AGAs. One is that high molecular mass proteins with high content of coiled-coils induce heightened autoimmune responses. The other is that Golgi autoantigens may be recognized as surface structures on cytoplasmic organelles that are released to the immune system when cells undergo cell lysis. Giantin is likely to be more stably associated with remnants of Golgi fragments than other Golgi peripheral proteins, because only giantin has a transmembrane domain. This work was supported in part by National Institutes of Health Grants AI39645 and AI47859 (EKLC), and Canadian Institutes for Health Research Grant MOP-38034 (MJF).